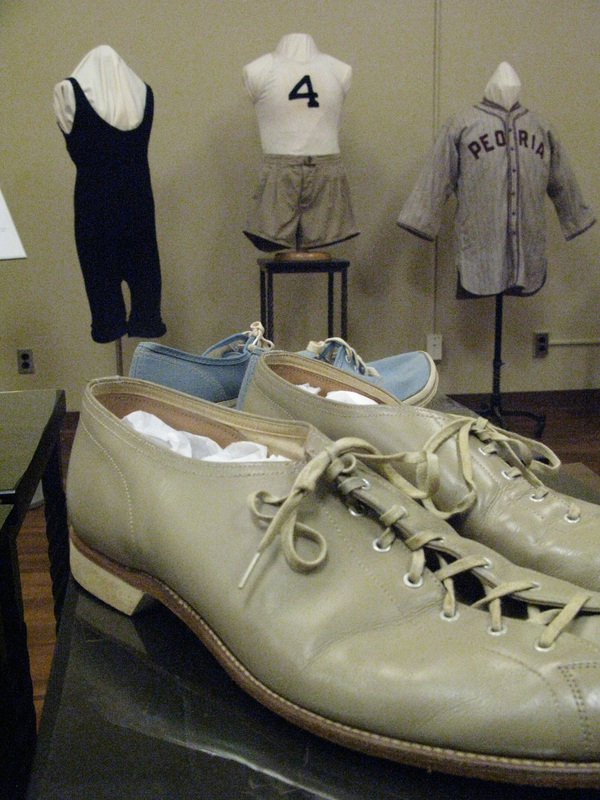 Men’s bowling shoes are part of the newest exhibit of the Lois Jett Historic Costume Collection. 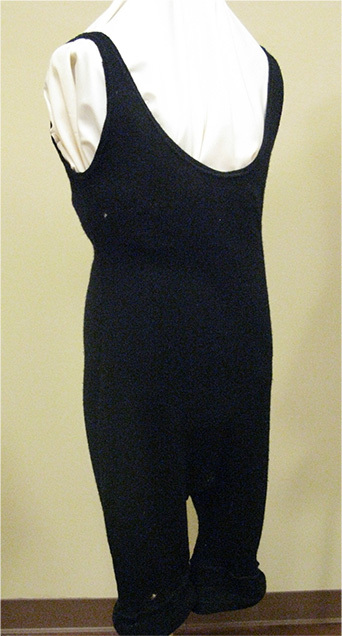 The Lois Jett Historic Costume Collection (LJHCC) in the Department of Family and Consumer Sciences at Illinois State University invites the public to the collection’s newest exhibition, Not Just Jerseys: Sportswear Through History, running through February 2, 2018. The exhibition features a range of garments for men and women, from those worn for active sports in the early 20th century to garments worn for leisure in the later 20th century. The exhibition was planned and installed by students in the fashion design and merchandising program at Illinois State. Swimming tights from the early 1910s in the Lois Jett Historic Costume Collection. Garments worn for active sports include wool swimming tights for women from the 1910s and a man’s baseball jersey from the 1930s. The swimming tights were designed and marketed by Annette Kellerman, a world-famous swimmer from the early 20th century. She advocated swimwear for women in which it was easier to swim, but her skin-baring design was a scandalous departure from typical bathing costumes for women at the time. 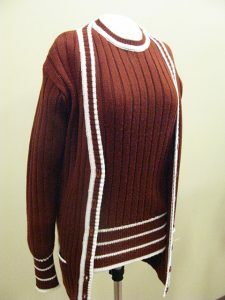 The baseball jersey was worn as part of a Peoria, IL team called “Farmers Livestock.” The wool striped garment contrasts today with lighter, easy-to-wash fabrics that are a part of most baseball players’ uniforms. 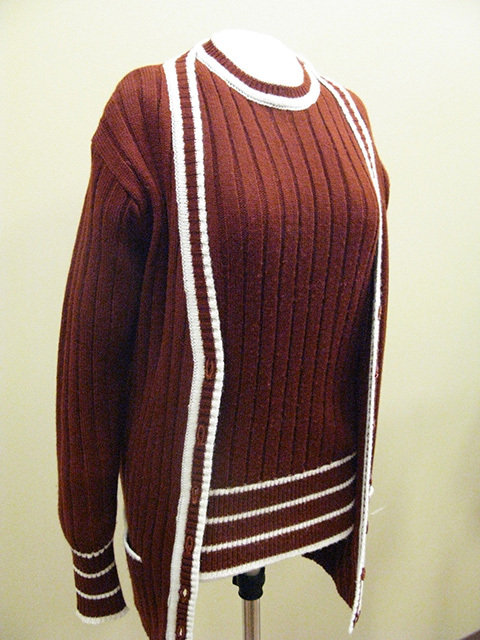 A 1970s sweater set in the Lois Jett Costume Historic Collection. Garments representing these different time periods of sportswear can be seen in the current exhibition. This free exhibition is located in 126 Turner Hall on Illinois State’s campus and is open to the campus and surrounding community. Gallery hours are Tuesday and Thursdays from 10 a.m.-noon through December 8. Other times may be scheduled Monday through Friday, 8:30 a.m.-4:30 p.m., by calling (309) 438-5960. For more information on the exhibition, contact Jennifer Banning.